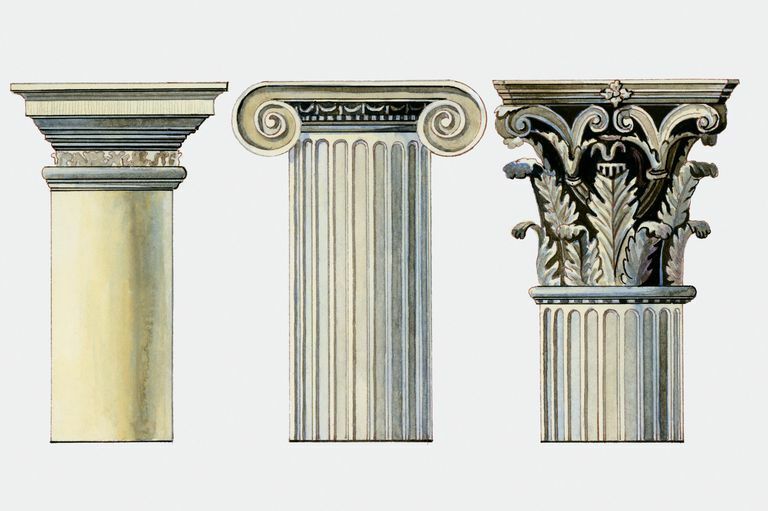 Columns, Posts, and Pillars — Where Do They Come From? Doric, Ionic, and Corinthian Column Capitals. The columns that hold up your porch roof may look simple, but their history is long and complicated. Some columns trace their roots to the Classical Orders of architecture, a type of "building code" from ancient Greece and Rome. Others find inspiration in Moorish or Asian building traditions. Others have been modernized from round to square. A column can be decorative, functional, or both. Like any architectural detail, however, the wrong column can be an architectural distraction. Aesthetically, the columns you choose for your home should be the right shape, in proper scale, and ideally constructed from historically appropriate materials. What follows is a simplified look, comparing the capital (top part), the shaft (long, slender part), and the base of various types of columns. 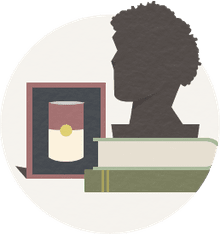 Browse this illustrated guide to find column types, column styles, and column designs through the centuries, beginning with the Greek types — Doric, Ionic, and Corinthian — and their use in American homes. The Block Atop the Doric Column Capital is the Abacus. With a plain capital and a fluted shaft, Doric is the earliest and most simple of the Classical column styles developed in ancient Greece. They are found on many Neoclassical public schools, libraries, and government buildings. The Lincoln Memorial, part of the public architecture of Washington, D.C., is a good example of how Doric columns can create a symbolic memorial to a fallen leader. Although Doric columns are the most simple of the Greek Order, homeowners are hesitant to choose this fluted shaft column. The even more stark Tuscan column of the Roman Order is more popular. Doric columns add an especially regal quality, however, as in this rounded porch. Many 19th century homes of the Neoclassical or Greek Revival style used Ionic columns at entry points. This type of column is more grand than the Doric but not quite as flashy as the Corinthian column, which flourished in larger public buildings. The architect of the Orlando Brown house in Kentucky chose columns to match the stature and dignity of the owner. Facade of New York Stock Exchange (NYSE) Designed by George B. Post. The Corinthian style is the most lavish of the the Greek Orders. It is more complex and elaborate than the earlier Doric and Ionic styles. The capital, or top, of a Corinthian column has opulent ornamentation carved to resemble leaves and flowers. You'll find Corinthian columns on many important public and government buildings, like courthouses. The columns on the New York Stock Exchange (NYSE) Building in New York City create a mighty Corinthian Colonnade. American Variation on the Corinthian Order. Because of their expensive lavishness and scale of grandeur, Corinthian columns were rarely used on Greek Revival houses of the 19th century. When they were used, the columns were scaled down in size and opulence compared with large public buildings. Corinthian column capitals in Greece and Rome are classically designed with acanthus, a plant found in Mediterranean environs. In the New World, architects like Benjamin Henry Latrobe designed Corinthian-like capitals with native vegetation like thistles, corn cobs, and especially American tobacco plants. In about the first century B.C. the Romans combined the Ionic and the Corinthian orders of architecture to create a composite style. Composite columns are considered "Classical" because they are from ancient Rome, but they were "invented" after the Greeks' Corinthian column. If homeowners were to use what might be called Corinthian columns, they may really be a type of hybrid, or composite that is more sturdy and less delicate. Tuscan Columns by Bernini in Vatican City. Another Classical Roman order is the Tuscan. Developed in ancient Italy, a Tuscan column resembles a Greek Doric column, but it has a smooth shaft. Many of the great plantation homes, such as Long Branch Estate, and other Antebellum mansions were constructed with Tuscan columns. Because of their simplicity, Tuscan columns can be found most everywhere, including on 20th and 21st century homes. The bungalow became a phenomenon of 20th century American architecture. The growth of the middle class and the expansion of the railroads meant that houses could be economically constructed from mail-order kits. The columns associated with this style house did not come from the Classical Order of architecture — there is little about Greece and Rome from this tapered, square-shaped design. Not all bungalows have this type of column, but houses built in the 20th and 21st centuries often deliberately avoid Classical styles in favor of more Craftsman-like or even "exotic" designs from the Middle East. Solomonic Columns at Cloister of St. Paul, Rome. One of the more "exotic" column types is the Solomonic column with its twisted, spiraling shafts. Since ancient times, many cultures have adopted the Solomonic column style to ornament their buildings. Today, entire skyscrapers are designed to appear as twisted as a Solomonic column. Ruins from the Egyptian Temple of Kom Ombo, 150 B.C. Brightly painted and elaborately carved, columns in ancient Egypt often mimicked palms, papyrus plants, lotus, and other plant forms. Nearly 2,000 years later, architects in Europe and the United States borrowed Egyptian motifs and Egyptian column styles. During the fifth century B.C. builders in the land that is now Iran carved elaborate columns with images of bulls and horses. The unique Persian column style was imitated and adapted in many parts of the world. Columns as a design element seem to be here to stay in architecture. Pritzker Laureate Philip Johnson liked to have fun. Noting that government buildings were often designed in the Neoclassical style, with stately columns, Johnson deliberately overdid the columns in 1996 when he designed the Town Hall in Celebration, Florida for the Walt Disney Company. Over 50 columns hide the building itself. They are the thin, tall, square style that are often found in contemporary house design — whether or not they have the Classical values of symmetry and proportion.